Family virtue cards are the perfect family gift. This deck of 52 virtues cards is not only a handy reference guide, but by focusing on a different card every day or every week, you will quickly gain a greater understanding of the path to God. Each card contains a spiritual quote, the meaning of the virtue, how to practice the virtue and an affirmation. Family virtue cards are the perfect family gift. How many virtues can you name off the top of your head? And how you figure out which is the best virtue in any given situation? This deck of 52 virtues cards is not only a handy reference guide, but by focusing on a different card every day or every week, you will quickly gain a greater understanding of the path to God. Each card contains a spiritual quote, the meaning of the virtue, how to practice the virtue and an affirmation. A companion to the Family Virtues Guide, which offers a coordinated program for infusing virtues into your family life. 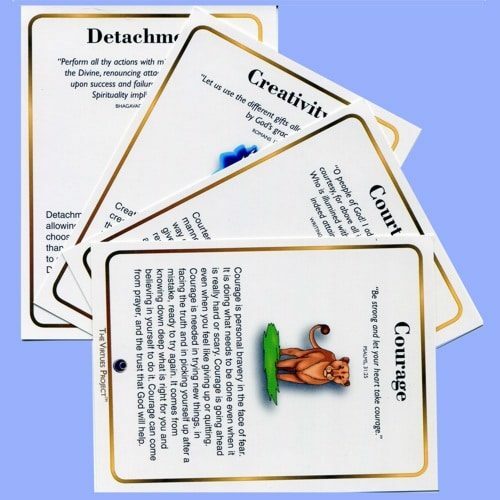 There are also classroom virtue cards appropriate for classroom use and virtue reflection cards for your personal use.